Did you know that when given the choice between a field of GMO corn and organic corn, wild animals always go for the organic corn first? Why? They can tell that there’s just something not right about the GMO corn! Genetically Modified Organisms (GMOs) are plants or animals that have been genetically engineered with DNA from bacteria, viruses, or other organisms. Genes are forced from one species into an entirely unrelated species in order to get a desired effect. Examples include injecting tomatoes and strawberries with fish genes to keep it from freezing; injecting corn with DNA from bacteria that is immune to herbicides and pesticides like RoundUp; or injecting salmon with growth hormone to make them grow larger. Studies on animals have documented the effects of GMO toxicity including: asthma, allergy, inflammation, accelerated aging, infertility, birth defects, and many more. Not only do GMOs themselves cause these problems but glyphosate, the main ingredient in RoundUp, and other herbicides and pesticides to which many of these GMO crops have been engineered to withstand, have been shown to have many toxic effects to humans and the environment. Changing the genes of food essentially causes the food look and act differently in our bodies, resulting in a whole host of negative effects that may be immediate or seem subtle and take many years to manifest into major health problems. So how can you avoid GMOs? Eat organic! Preferably local organic! Organic foods are not permitted to be GMO. Grow your own garden with organic seeds or stop by your local farmers market. Don’t be afraid to ask the vendors if they are organic or if they use chemicals on their produce. Always try to eat organic meat and animal products as animal feed is primarily composed of GMO grains – which essentially makes the animal GMO! Look for the Non-GMO Project Verified logo on packaged foods – these foods have been verified to not contain GMOs. 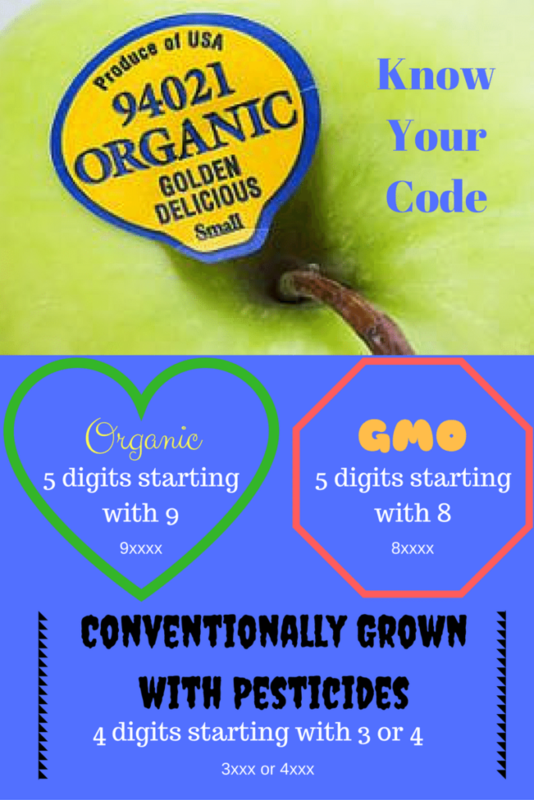 Learn to read the Produce Lookup Codes (PLUs) at the grocery store. And remember…you are what you eat!